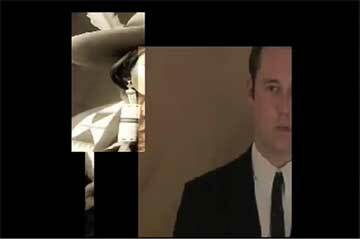 This project is a programmed video installation that I co-created and directed in 2012 for the Laguna Museum of Art, in collaboration with visual artist Antoinette LaFarge. The installation runs on a semi-randomized cycle over 70 minutes; and together with an associated live performance, it models the problematic nature of collective memory as a bulwark against ideological corruption. For this reason, it never runs the same way twice. On opening night, the actor seen in these video stills gave a live performance as a nameless government functionary while interacting with a video environment. When he was done, the automated installation was triggered to constantly assemble and reassembled videotaped fragments of his monologue into a montage with still images drawn from a large library. As time passes, these assemblages become less and less coherent and more and more degraded, signaling a breakdown in the personality of the government functionary. After 70 minutes, the installation resets and begins again. We are constantly amazed at how the program is capable of throwing up images of dramatic potency and aesthetic interest at any point in the cycle. Of various images grabbed at random intervals, here are a few culled from attempts to document the project. You can clearly see the degradation over time in these images, and how this is not simply a question of things becoming less distinct or confused. Instead, it actually creates a new clarity that speaks about the theme and content of the piece: moral corruption and the subsequent loss of one’s humanity. This entry was posted in Directing, New Media, Projects.